A somber atmosphere reigned over the town of Daraga when we went to visit the Church of Nuestra Señora de la Porteria. Like a set of eyes coming from a funeral, the skies hovering above was subdued yet haunting and sad. The jabbing wind blowing against my face reminded of the aftermath of typhoon Mina, which battered the province a few days before we arrived. Some of the dark clouds which "Mina" brought remained and like a jealous lover, it protruded over the landscape of Mayon Volcano, totally sheltering it from our sight. The people we meet on the road is oftentimes the least mentioned in travel stories shared to friends. People, as much as places and food make up a third of one's over-all travel experience. In most cases, it is the forgotten allure of the newfound wisdom we gathered, while gutting it out with the forces of nature, walking the long paved highways, crossing muddy creek, hiking up the inclined slope of a mountain. If only we could remember more clearly, we'd be showered with images of nameless strangers, who became new friends, persons who made a lasting impression, while we're stuck in an inconvenient situation on the road and who plucked us out with whatever offerings their Earth hardened hand could lend. 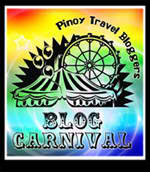 In the September Pinoy Blogger's Blog Carnival. Travel Bloggers share what they describe as their own "Unforgettable Human Encounters on the Road". I've always been interested with seeing a fish wag its tail and weave through the waters in an almost synchronized movement, just as the humans move gracefully in a sprint motion with all body muscles and flesh conniving to generate a fluid action, its just that, a fish present it better because it does so in the waters.